Happy Winter from Harmony Fields! We have been enjoying some quiet and creative project time on the farm. However, sheep season is upon us and we have to tend to our ewes. Most of them are due to give birth over the next few weeks and we are watching and waiting with much anticipation. 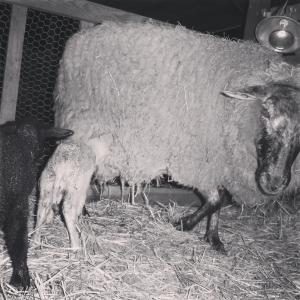 It is always a frenzied, but joyous, time when the lambs finally arrive. This winter has been a good time to work with the wool we have amassed on the farm from the previous year’s shearing. 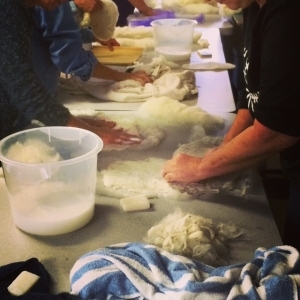 We now have processed roving to sell and we offered our first felting class with Elizabeth Moncrief in January. During the class we all learned that flat felting is hard work, but an amazing process. Felting ladies hard at work in our Jan 24th workshop. Next month we will be continuing our work with wool and have invited Elizabeth back to teach a dyeing workshop for fiber artists on March 7th. Be sure to register soon as our last class with Elizabeth filled up fast. There will be sure to be many little lambs running around by then, too! We are slowly but surely getting ready for this growing season. While the weather has been quite warm and welcoming so far, I am not fooled. It is still winter, so don’t get too far ahead in planting or you might lose your tender seedlings to a freeze! We just entered the Year of the Sheep and according to some predications this is a time for much creativity and community! Yay for sheep! Dean and I are excited to finish our first Dovetails album this winter and you can pre-order copies here. I have been writing a lot this winter and hope to share more about that soon. In the meantime, join me and several other local poets for a Poetry Northwest New Issue release reading on March 4th at 7:30 at Phinney Books in Seattle. I hope winter has treated you well. If you are needing to kickstart your creative juices, our workshop schedule for the year should be up and finalized in the next few weeks, so stay tuned.